It is 1944. Anna Grant inherits a strange legacy from her mother, Dina: a treasure retrieved from a disaster in the Middle East, and a pile of yellowing notebooks. The handwritten pages hint at a world of elegant Victorian tables and lavish balls. Yet behind the apparent calm in the family lies a story of deception and betrayal. Anna searches for the truth about her grandfather David. What was the catastrophe that left him orphaned in 1837? What brought his seemingly happy marriage to the brink of collapse? She retraces journeys, following a trail from Safed to Gibraltar, from London to Lisbon. While Anna uncovers layers of joy and sadness, revealing the reason for her mother's repressive behaviour, she copes with her own eccentric husband and the problems of bringing up a child in wartime Britain. But it is the final journey that unlocks the mystery of inherited misery. In her search for the origin of the treasure, Anna uncovers a secret that tormented David alll his life. Find out how a tragedy that happened 170 years ago affected four generations. Discover the notes that span over a century of Jewish food. Here is a glimpse of the sweets from Spain and Portugal and classic dishes borrowed from English and French cuisine. The BBC, in conjunction with the British Museum, has been running a series of talks "The History of the World in 100 Objects". They invited contributors to send in interesting objects to add to their website. Judy Jackson was originally a translator (Italian, French and German). When she was in her twenties she started a small catering business. This led to giving cookery classes in her home and the publication of seven cookery books. Now she is working on novels. The research for this book has taken her to Gibraltar, Lisbon and Safed. When she is not in the reading rooms of the British Library she still gives the occasional cookery class. She also writes restaurant reviews for Time Out (Eating Out in London). 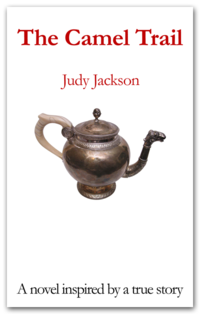 Judy Jackson has been published by Faber, Macdonald, Marsons and Anness/Lorenz. One of her books sold over 40,000 copies. She has produced freelance pieces for many national newspapers, including The Times, The Independent, The Evening Standard and The Telegraph. Other work includes an unpublished biography, 'Tess Blackburn' and a novel about a concert pianist. Judy is married with four sons, four American daughters-in-law and twelve grandchildren who live as far apart as the United States, England and Israel. After the success of her first novel, Judy has returned to cookery and has published a new book for children. George Kedourie - a writer, reviewer and general web guru - has interviewed the author for georgerecommends, an archive of recommendations and reviews. You can find a video of the interview here. Here is the first chapter of The Camel Trail. This spoken version was created for a friend who is blind, so it includes a description of the picture on the front and what is written on the back cover. The Camel Trail is proving popular in bookclubs. It has been chosen as a favourite read from London to Newcastle, New York to Hollywood. "Have read it a second time. Fascinating family history.. love the way you intertwine different periods" Lula V, Sydney, Australia. "The scenes in Safed give a real sense of having been there and experienced it." Cynthia P, Cape Town. This is not a book about food - yet the smells of food: delicious, succulent, flavoursome, rich and sweet, light and refreshing, waft through every page of The Camel Trail. Judy Jackson's new novel, a saga of four generations of a Jewish family, takes us from Safed in the mountains of Galilee in the 1830s to north London in the 1970s. The tale, which is based on a true story, follows David, orphaned in the great Safed earthquake of 1837, to the merchant society of mid-Victorian Gibraltar and then on to the London of the 1870s; and Dina, his daughter who returns to the sardine merchants of Gibraltar only to be catapulted back to London as an impoverished young widow. Then we follow Dina's daughter, Anna, who finds fulfilment in the iridescent strands of cooling sugar and the unctuous smoothness of melted chocolate until wartime rations force her into more creative efforts with sheeps' heads and the occasional hard-won onion. Food apart, The Camel Trail is a stonkingly good story. Moving seamlessly from Gibraltar in the 1830s to London in the 1940s, it charts the tragedies and joys of each generation of the Levy family as they rise to wealth and power, and sink back to relative obscurity until, at last, the dark secret which David has carried from Safed, and which haunted both his children and his grandchildren, is unearthed by his great-granddaughter. The author traces the journey of the teapot and the several generations of the Jewish family that used it and transported it from Safed to Gibraltar, through London to Lisbon. Some moves were practically and economically motivated, others necessitated by disaster and emergency. The jigsaw puzzle's final piece of why the teapot survived at all is terribly sad, all the more so for having the ring of truth about it. The book is peopled with recognisable, familiar characters - always believable in their sometimes petty and less than admirable behaviour. Food is the thread here throughout the narrative. Every chapter opens with a recipe or a household hint from the period of the chapter, recovered from the notebooks of the characters. They are charming and idiosyncratic. Knowing that an envelope sealed with egg white can never be steamed open will not change my life, and neither am I likely to underake the production of yemma, with its twelve egg yolks, but I loved reading about it. These snippets add in every sense a taxture and flavour to this family saga that is always richly absorbing and moving. From Jewish Life, Summer 2007. The novel is inspired by a true story: Judy Jackson's own exotic family history, carefully logged in their account ledgers, notebooks and handwritten recipe books. The peripatetic Levys - sardine and olive oil merchants - take the reader from Morocco to Safed to Gibraltar, London to Lisbon and back again. The Camel Trail is a cross between Jane Austen and Mrs Beeton, with a touch of Agatha Christie thrown in. Judy Jackson sustains interest throughout: the reader is keen to find out what happens next. She gives interesting snapshots of English 19th century social history and is best when describing the minutiae of what the characters wore, how they entertained, and, above all, what they ate. From The Sephardi Bulletin, August 2007.